Or view larger version. Aw Lawm I (Long Rock). 1979. Dalbert Castro. Acrylic on canvas. Collection of Oakland Museum of California. Gift of the Aeschliman-McGreal Collection. 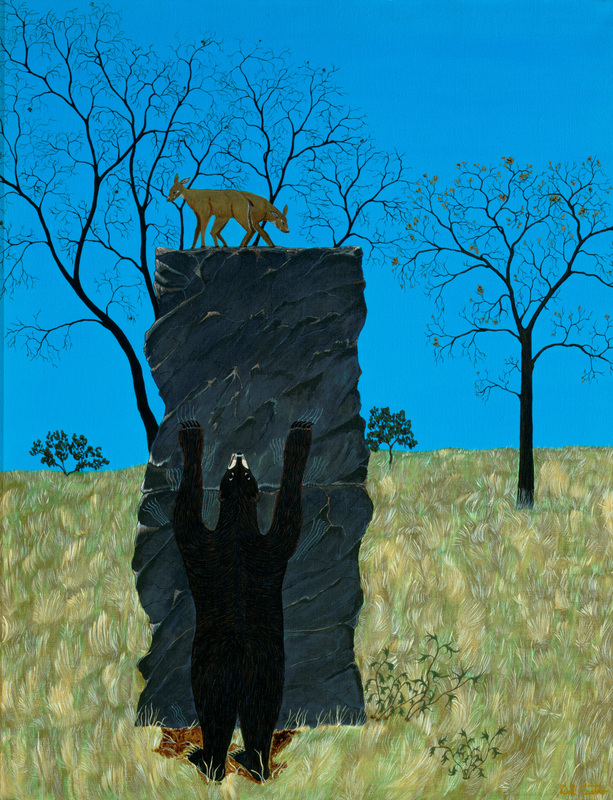 This painting, by Dalbert Castro, Aw Lawm I (Long Rock) is done in acrylic paint on canvas and depicts a bear standing on its hind feet reaching upward toward two deer that are standing on a tall rock. Castro is a Nisenan Maidu Native American, born in 1934 near the ancient village of Holakcu, near present-day Auburn, California. Castro's childhood was spent among tribal elders, from whom he learned the traditional legends and stories of the Maidu people. His Nisenan Maidu background is rich in the cultural history and regional flavor of the Sacramento Valley and foothills, which he captures in his paintings.